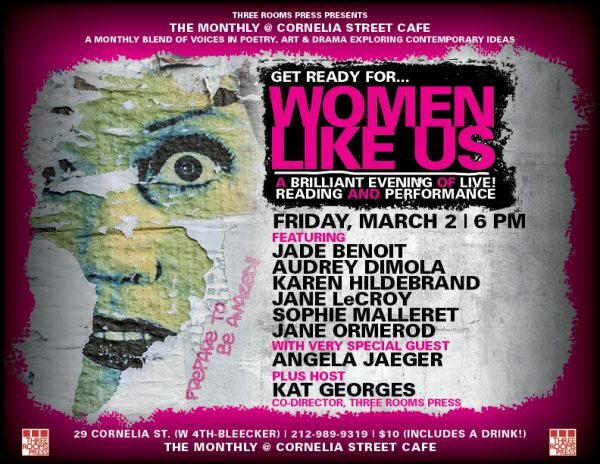 Three Rooms Press presents a slate of extraordinary NYC-based poets and performance artists at WOMEN LIKE US on Friday, March 2, 2018 at 6 pm at Cornelia Street Cafe as the latest installment in the ongoing series THE MONTHLY. The event features readings and performances by superb writers including poets Jade Benoit, Audrey Dimola, and Karen Hildebrand, performance artists Jane LeCroy, Sophie Malleret, and Jane Ormerod, with special guest, poet and singer Angela Jaeger (Pigbag), plus Kat Georges, playwright, poet, and co-director of Three Rooms Press. Doors open at 5:45. Admission is $10, which includes a free drink. Cornelia Street Cafe is at 29 Cornelia Street, in the West Village, between W. 4th Street at Bleecker (http://corneliastreecafe.com/). JADE BENOIT’s poetry has appeared in Black Warrior Review, LUNGFULL! Magazine, Poebe, Apalachee Review, Nashville Review, and many others. AUDREY DIMOLA is a native of Queens, poet (Wildlight, forthcoming), performer, curator and Director of Public Programs at Socrates Sculpture Park. KAREN HILDEBRAND is an editor and poet who’s debut collection, Crossing Pleasure Avenue, is forthcoming this April from Indolent Books. ANGELA JAEGER is a poet and singer, best known for her work as vocalist of post-punk bands Pigbag, Stare Kits, and Drowning Craze. JANE LeCROY is a performance artist, musician, and poet, and the author of multimedia poetry collection (Signature Play, Three Rooms Press). SOPHIE MALLERET is a French-American performance artist, actress, poet, and curator of the New York City Slow Slam reading series. KAT GEORGES is the author of poetry collection Our Lady of the Hunger and forthcoming Three Somebodies: Plays about Notorious Dissidents. Co-director of Three Rooms Press. The event is part of THE MONTHLY series at Cornelia Street Cafe, hosted by Three Rooms Press, which brings together writers, artists, philosophers, and scientists to delve into a different theme each month from divergent perspectives. Past themes have included conspiracy theories, Code Poetry, an exploration of poetry that simultaneously works on multiple levels and languages, and notable literary figures including Charles Bukowski and William Burroughs.